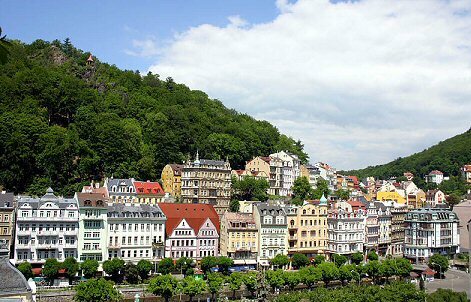 The Hotel Kučera is situated directly in the heart of the spa zone of Karlovy Vary (Carlsbad). Curative mineral springs are situated only 50m from the entrance to the hotel, the Hot Spring Colonnade is 50m and the Wooden Colonnade is 80m from the hotel. In spite of the fact that our hotel is located in such an attractive area our clients can arrive directly in front of the hotel where they check in, then park their cars. 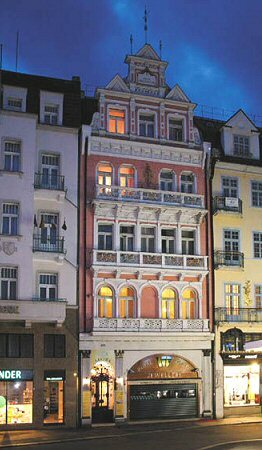 Hotel Kucera offer accommodation in a two types of rooms: Room category “A” (6 rooms in total): Spacious rooms (over 30m2) with balcony and view of the colonnade, Gilded Art Nouveau ceilings, Bathroom with shower, WC, hairdryer etc. SAT, TV, telephone with direct line, refrigerator, safety deposit box. 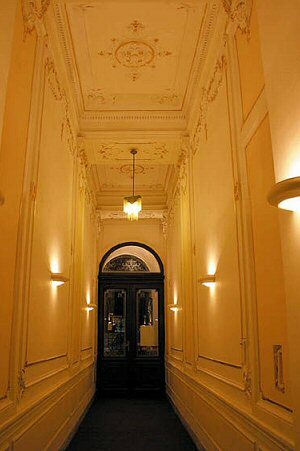 Room category “B” (9 rooms in total): Quiet rooms with windows facing the opposite side of the colonnade, Bathroom with shower, WC etc. SAT, TV, telephone with direct line, refrigerator. Rooms in category “B” have no standard size and appearance, they differ one from another. 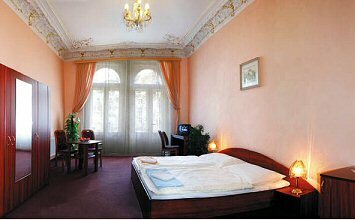 Additional services of the Hotel Kučera: we arrange hotel transport, access to the internet is possible in the hotel office, we offer office services (sending faxes, copy services), we lend hairdryers, irons, coffee pots etc. free of charge, we accept most credit cards, accommodation of pets is free of charge, we can book spa treatment procedures in the nearby sanatorium for you, you can choose from our stay packages or we can even prepare an individual stay package according to your wishes, we can give you recommendations for spending your leisure or even organize something for you, you have at your disposal a shoe cleaning machine, hotel safety deposit box, souvenir shop, late check-out (paid service, we cannot guarantee this in all cases). 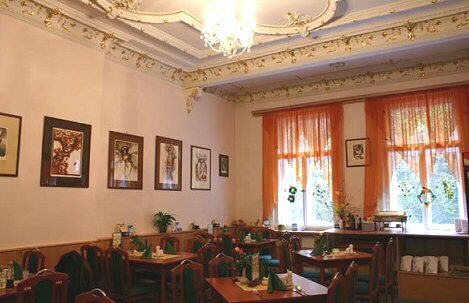 Meals are served in the restaurant on the 2nd floor of the hotel. We serve all our clients a hearty buffet style breakfast (from 8 am to 10 am) which is included in the hotel’s accommodation price. 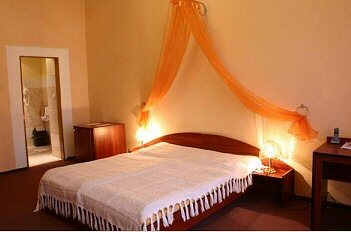 Other furnishings of the hotel Kucera: Wellness centre (1st floor), restaurant (2nd floor), travel agency (offering trips and excursions), lift, shoe cleaning machine, hotel safety deposit box.